Let's draw double number line diagrams like a pro. Based on where you placed the numbers, locate and label four more fractions or decimals on the number line. The other day, we made green water by mixing 5 ml of blue water with 15 ml of yellow water. We want to make a very small batch of the same shade of green water. We need to know how much yellow water to mix with only 1 ml of blue water. On the number line for blue water, label the four tick marks shown. On the number line for yellow water, draw and label tick marks to show the amount of yellow water needed for each amount of blue water. How much yellow water should be used for 1 ml of blue water? Circle where you can see this on the double number line. How much yellow water should be used for 11 ml of blue water? How much yellow water should be used for 8 ml of blue water? Why is it useful to know how much yellow water should be used with 1 ml of blue water? Follow the instructions to draw a double number line diagram representing the recipe for art paste. Use a ruler to draw two parallel lines. Draw at least 6 equally spaced tick marks that line up on both lines. Along the water line, label the tick marks with the amount of water in 0, 1, 2, 3, 4, and 5 batches of art paste. Along the flour line, label the tick marks with the amount of flour in 0, 1, 2, 3, 4, and 5 batches of art paste. Compare your double number line diagram with your partner’s. Discuss your thinking. If needed, revise your diagram. How much flour should be used with 10 pints of water? How much water should be used with 24 cups of flour? How much flour per pint of water does this recipe use? A square with side of 10 units overlaps a square with side of 8 units in such a way that its corner $B$ is placed exactly at the center of the smaller square. 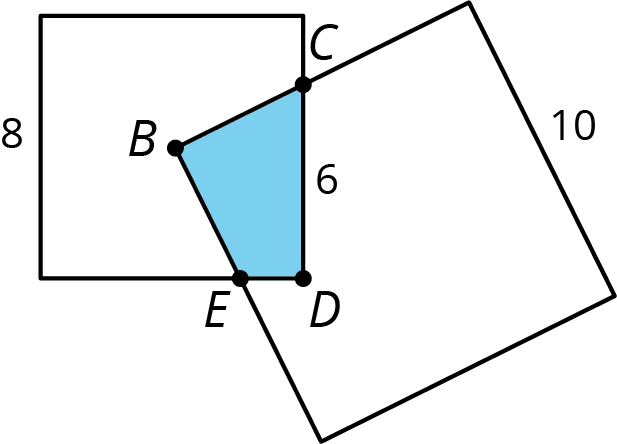 As a result of the overlapping, the two sides of the large square intersect the two sides of the small square exactly at points $C$ and $E$, as shown. The length of $CD$ is 6 units. What is the area of the overlapping region $CDEB$? The other day, we looked at a recipe for tuna casserole that called for 10 ounces of cream of chicken soup for every 3 cups of elbow-shaped pasta. Draw a double number line diagram that represents the amounts of soup and pasta in different-sized batches of this recipe. If you made a large amount of tuna casserole by mixing 40 ounces of soup with 15 cups of pasta, would it taste the same as the original recipe? Explain or show your reasoning. The original recipe called for 6 ounces of tuna for every 3 cups of pasta. Add a line to your diagram to represent the amount of tuna in different batches of casserole. How many ounces of soup should you mix with 30 ounces of tuna to make a casserole that tastes the same as the original recipe? The two parallel lines should have labels that describe what the numbers represent. The tick marks and numbers should be spaced at equal intervals. Numbers that line up vertically make equivalent ratios. The word per means “for each.” For example: he paid \$5 for each ticket, so the cost was \$5 per ticket.